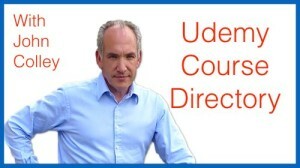 Udemy Course Directory - Why Its Worth At Least $1! In late November 2015, I launched my Udemy Courses Directory on Udemy and immediately did an update on the Course Data in December. Discover why this is the most amazing way to explore the Udemy Market Place and why I am giving this course away for just $1! This course took me weeks to put together, the most challenging part being how to get the data off the Udemy website in an appropriate manner. The result is a Directory of over 21,500 courses from over 9,100 instructors. This is approximately doubling every 12 months so it will take some keeping up with! Why Create The Directory in the First Place? I don’t find Udemy search particularly helpful – the algorithm delivers courses in an organised manner but with no detailed knowledge of the alogrithm, how do we know we are getting the best courses for us? 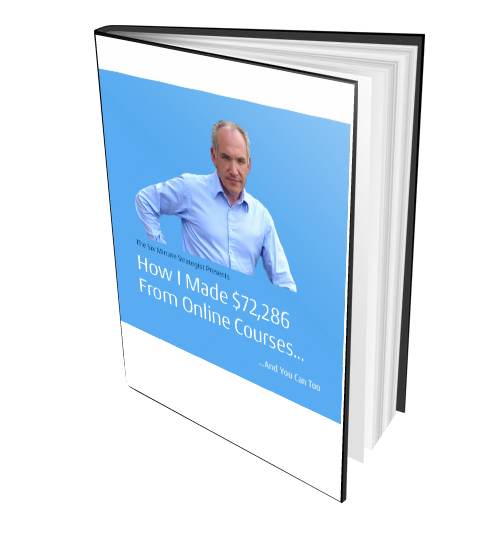 As an instructor, I wanted much greater insight into the market place and my competitors. If I was going to choose a course, I wanted to select the best course for me, not the best course suggested by Udemy. I am not suggesting that there is anything wrong with their algoritm, I just want more input and control of the selection process! The result is a spreadsheet which has 20 data points about courses as well as information about individual instructors. The information includes the following fields. Links to other instructor courses? However, excel or comma separated fields are very limited in they ability for complex search and research, unless perhaps you are a programming wiz in Excel! 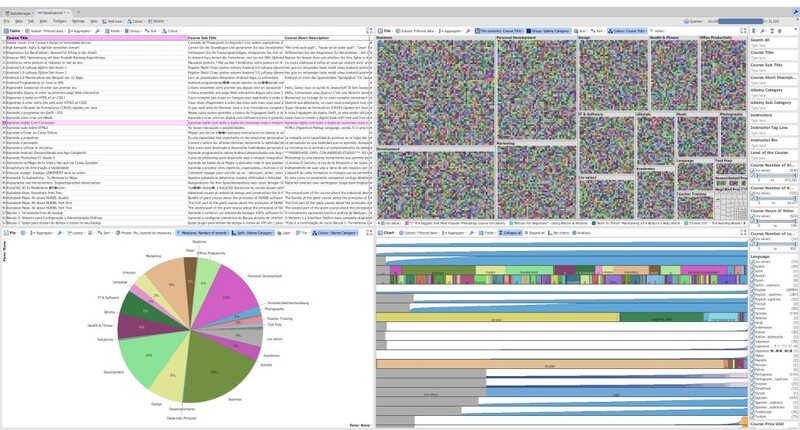 This is where the amazing Visokio Omniscope Viewer comes into its own. This software is sophisticated (while being easy to use). It enables you to search very large datasets by looking at the whole dataset and then selecting, querying or just moving out the information you don’t want. This is not a tutorial on the Omniscope, that is provided in the course. As a holder of a licence for this software, I can create .iok files which you can open with the free to download viewer and use yourself. There are limitations. You cannot change, export or print the data. However, I do provide links which you can click on to go to the Courses and the Instructors Profile pages once you have selected your short list of either. 6. You can carry out a series of different search criteria one after the other, really interrogating the data to find what you want! Imagine how much time and money you can save by finding and buying only the best courses for you from the best instructors! They are so much easier to find using the directory! Why Price the Course at $1? Free Courses just invite a large number of “course collectors” into your student community who have no commitment or real interest in taking the course. Its free, I’ll grab it now and look at it later, except they don’t. Then they unsubscribe from emails (as they have no real interest in you or your courses) and that hurts you twice with Udemy. So Free is out! I have priced the course at $19 in the Udemy market place and that will probably go up so that it makes a minor impact in Udemy promotions. So why $1? I want to make this course as widely accessible as possible – surely nearly everyone can afford $1! If you make this commitment (is that really the right word?) you are more likely to take time to download the Omniscope Viewer, unzip and open the .iok files and work with them. Did I mention that there are also Top 100 datasets for instructors and courses too! And of course, Udemy’s 30 Day Money Back guarantee still applies. Discover My Udemy Courses Directory Here for just $1! -> Discover the Best Instructors! ->The Course Every Udemy Student and Every Udemy Instructor must have! If 10,000 students enroll in this course I will have made a difference, please help me to achieve this! ← Announcing the New Six Minute Strategist Chatroom!